I had to (got to?) endure my husband’s explanation of how well two-space transfers and Hamiltonian work for solving anything from polynomials to derivatives to integrals. I think that was the gist of it .. I tried to feign interest like a good friend would. Here’s to having math buddies who keep life interesting! It’s an understatement to say that not everyone likes math, all the more so as the topics get advanced. On the rare occasions when I bring up math here, I try to keep simple, as in this array which is nothing more than elementary arithmetic. If nothing else, I’ll bet you appreciate the symmetry of this array. When I see things like this, I might as well be watching a magician pull a rabbit out of a hat, except I have a better shot at figuring out the rabbit trick. When I first looked at it I saw the structure of an etheree, which was a neat reminder that math and poetry aren’t completely unrelated. This array isn’t as rabbit-out-of-a-hat-y as you might think. 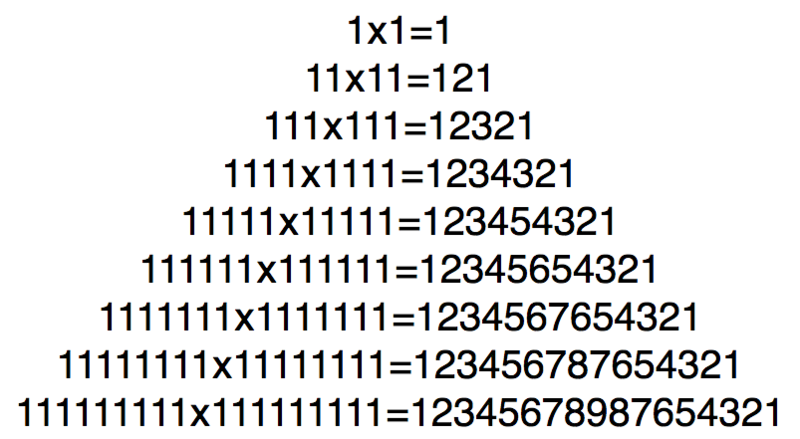 If you write out the old-fashioned multiplication of, say, 111×111, you’ll see that as you add up the columns to get the answer, there’s one more 1 each time as you move from the right toward the center, and then one less one in each column as you continue left past the center. For some people, math is poetry! Not only that, when I did it by hand, I finally noticed the palindromes — on both sides. That’s really cool! Glad you got it. On the left side you have minimalist palindromes because all the digits are identical. It’s on the right side that the palindromes stand out. Now you can make up a little for your earlier non-appreciation of math, which has so many relationships as fascinating as this one. Don’t sell yourself short; there’s still hope. You’ve got it: fingers for figures. I wanted to find something alliterative in German that would be appropriate for fingers and numbers. What I came up with is: zehn zu zählen. You can let me know if that sounds awkward. That’s a new palindrome for me. I’d thought of mentioning that each side of the array of equations in the post is palindromic but I decided to keep things simple and not say much. That is what I saw in it. Is there something more that I missed? Beyond the palindrome, on the right side there’s the way the digits go up and then back down, with each row reaching a highest value that’s one more than the row before. A good school curriculum would expose kids to many things like this that are both cool and not hard to understand. Speaking of which, math uses the symbol “| |” to represent what’s called the absolute value of a number. The absolute value tells how far a number is from 0. For example, |3| = 3 and |-3| = 3 as well. A far cry from things botanical for a change. It’s the closest to musical notation you’ll ever get from me. This is really cool, and very appropriate for 11/11. I forwarded it to the two accountants in my life for their entertainment. They say there’s no accounting for taste, so I hope your accountants do find this to their taste. Thanks for forwarding it. They both liked it. Later I was reading a magazine and came across a story of a couple who got married at 11:11 on 11/11/11. Crazy coincidence. What a coincidence. In fact I had an afterthought that I’d have done better to post this at that time on November 11, 2011. Yes, I had to reread the paragraph to be sure I was seeing what I thought I saw. Very very interesting! I must pass this on to the mathematicians in my family. Neither flora nor fauna for a change. If you get any interesting comments from those family members of yours, please pass them along. Hooray for getting it! Schoolkids should be exposed to many more things like this. I think ideally there should be a mix of fun stuff and down-to-earth practice. It takes effort to get good at something, but there can be ice cream along the way.